West Windsor, N.J. – What happens in Vegas is downright hilarious! 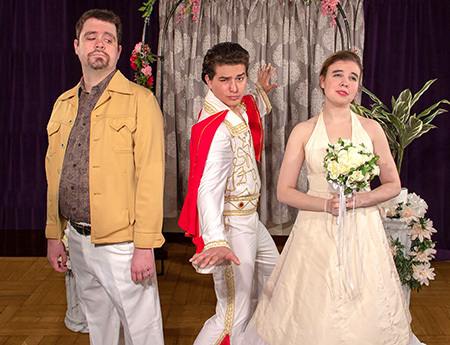 The Yardley Players present the laugh-out-loud “Four Weddings and an Elvis” at Mercer County Community College’s (MCCC’s) Kelsey Theatre in February. Dates and show times are Fridays, Feb. 15 and 22 at 8 p.m.; Saturdays, Feb. 16 and 23 at 8 p.m.; and Sundays, Feb. 17 and 24 at 2 p.m.
Kelsey Theatre is located on MCCC’s West Windsor Campus, 1200 Old Trenton Road. The community is invited to an opening night reception with the cast and crew on Feb. 15. Sandy is the three-times-divorced owner of a Las Vegas wedding chapel. She has seen her fair share of unusual couples, but the matrimony business is about to get a whole lot weirder. There’s Bev and Stan, who are getting married by “The King” to exact revenge on their exes; Vanessa and Bryce, two aging, arrogant stars who are tying the knot as a publicity stunt, and are vexed that Elvis doesn't even recognize them; and Martin and Fiona, a gentle postal worker and a tough ex-con trying to exchange their vows before the police arrive. But the final wedding is the best and funniest of them all. Add them all up and you’ve comedy galore – and a touch of romance that’s sure to please. The cast features Tristan Takacs of Trenton as John (Elvis); Susan Galli of Lambertville as Sandy; Tim Moran of East Windsor as Stan; Erin Wurtz of Levittown, Pa., as Bev; Barry Leonard of Monroe as Lou; Alana Caraccio of Doylestown, Pa., as Vanessa; Tom Chiola of Trenton as Bryce; Christopher Schmalbach of Palmyra as Fist; Samantha Otto of Langhorne, Pa., as Fiona; and Marc Suznovich of Hamilton as Marvin. The production team includes Producer Marge Swider, Director Liz Wurtz, Stage Manager Lauren Donahoe, Set Designer John Maurer, and Costumer Anthony Remer. Lighting design is by M. Kitty Getlik and sound design is by Dan Braeckman. Publicity is by Marge Swider and the program is by Kristy Davis. Tickets are $18 for adults; $16 for seniors; and $14 for students/children. They may be purchased online or by calling the Kelsey Box Office at 609-570-3333. Kelsey Theatre is wheelchair accessible, with free parking next to the theater. 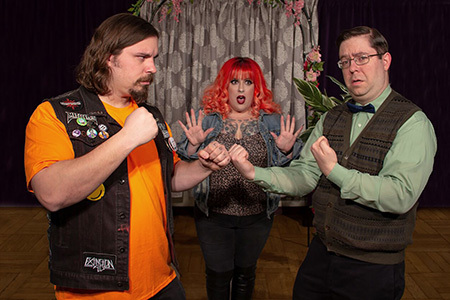 Getting even with the exes are Tim Mora, left, as Stan and Erin Wurtz as Bev. Tristan Takacs is John (a.k.a. Elvis)! No love lost between Christopher Schmalbach, left, as Fist and Marc Suznovich as Marvin. A horrified Fiona (Samantha Otto) looks on. Get me to the chapel on time! 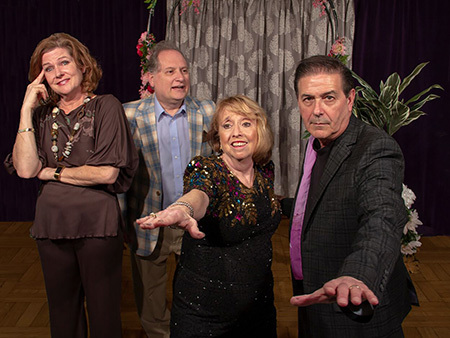 From left are Susan Galli as Sandy, Barry Leonard as Lou, Alana Caraccio as Vanessa and Tom Chiola as Bryce.